Pollution covering Beijing on Feb. 25, 2014. 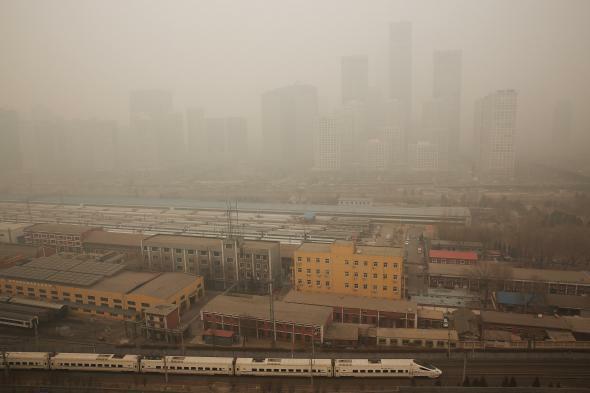 With Beijing’s dense population and smoggy skies, it stands to reason that the Connecticut-sized city would be radiating an outsized environmental impact. But until now, we weren’t clear on just how bad it was. While Beijing is hardly the only major city dealing with these issues, the sardine-packed capital of China has become the poster child for out-of-control urbanization. Recently, its government has taken steps to curb its pollution and greenhouse gases, vowing to clean up more than 1,000 festering landfills and promote hybrid and electric vehicles. Unfortunately, neither will have much of an impact on the changes being wrought by the immense growth of its sheer physical infrastructure.